On March 3rd, 2010, Mala'ai, The Culinary Gardens of Waimea Middle School, the inspirational model of the school garden movement on Hawai'i Island, held its five-year anniversary celebration. At the mid-day event, as cloud-shrouded Mauna Kea stood sentinel against a bright blue sky, the trade winds stormed across her slopes towards Waimea. Nearly two hundred young and old gathered in the wind by the garden, equally divided between student-gardeners and community supporters to hear Kumu Pua Case present the opening pule. Waimea Middle School students walk to Mala'ai for the 5th anniversary celebration. 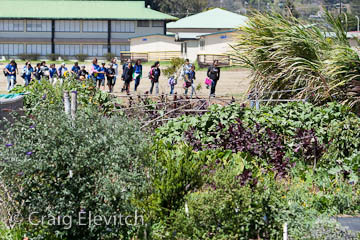 The vision began seven years ago, in 2003, when Dr. Michelle Suber, a Waimea physician, saw the potential for creating a middle school garden training experience that could have widespread health, educational and community benefits. Her vision was supported by the Waimea Middle School teachers and staff along with community leaders. After two years of planning, in 20005, when the current location of the garden was nothing but Parker Ranch pasture land, the first seed for the school garden was planted. Under the dedicated leadership of Amanda Rieux, the Mala‘ai Garden Manager, the pasture has become a beautiful, productive community of thriving plants, wildlife, students, adult staff and volunteers -- and wholesome food. They have not only transformed the land, but also the Waimea MIddle School community. Today, all 280 students at the school participate in the Mala’ai school garden program as part of their regular curriculum. A highlight of the celebration was the flags. Several students and program director, Amanda Rieux, read from a sample of the 150 beautiful Aloha 'Aina flags that had been created by the students and supporters for this celebration, and that were then strung throughout the garden classroom. The flags, of hand-drawn pictures and sayings, held the hopes and dreams of the community, and presented a moving testimony to the hard work, joy and deep learning the students have experienced. Another highlight was the seven member student ukelele ensemble, serenading in tune with the wind. And then there was the surprise award. Each year the Cooke Foundation in Honolulu presents gifts and awards for beautification projects in the elementary, middle and high schools of Hawai’i. This year Mala‘ai was presented with the middle school beautification award: a gift of $5,000 along with a beautiful plaque. One of the most significant and heart-lifting developments in Hawai‘i’s sustainable food movement over the past several years is the remarkable growth of school gardens. On Hawai‘i Island in particular, since the creation of the of the Hawai‘i Island School Garden Network (http://www.kohalacenter.org/HISGN/about.html) in 2007, nearly 50 public, charter and private schools have established school garden programs. These programs have been inspired by Mala‘ai’s model of a wholistic, multi-dimensional approach that integrates the school curriculum with practical farming skills, student health, indigenous land values, community service and the development of a local food economy. Check our Events Calendar and Announcements for new and ongoing happenings at Mala'ai. And if you plan to pass through or visit Waimea, set aside a moment to stop and witness the bountiful creation of Mala‘ai, the Culinary Gardens of Waimea Middle School, a model for Hawai’i school gardens. For directions and more information see http://malaai.org/ .